Amazon settlements are generally paid every 1-2 weeks, but will often cross a month boundary. For example, one settlement may start on February 20th and run through to March 06th. A2X will split the settlement data according to which month the sales or fee actually occurred in. This ensures that your financial accounts properly record the transactions in the month that they've occurred in. This also makes months more comparable to previous months and years for your reporting. 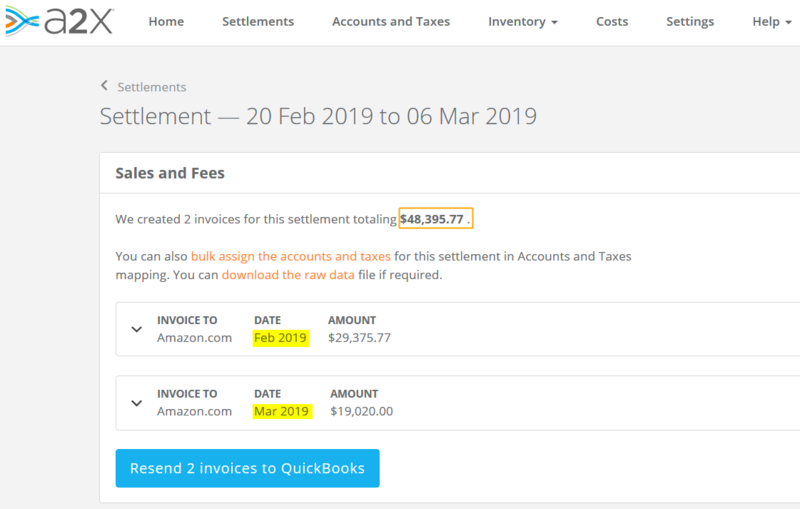 Please Note: When we split the settlement entry in QuickBooks, we use a 'Carried Forward Balance' account to carry over the pending Amazon settlement balance. This allows you to simply reconcile the deposit from Amazon to a single journal entry only reflecting the total final settlement. Our example settlement period starts on Feb 20th and runs through to Mar 06th. As you see below, A2X splits the settlement so that the correct settlement data is allocated to February and the correct settlement data is allocated to March. After sending these from A2X to QuickBooks, you will see the two journals that contain a Carried Forward Balance amount. The February entry is a debit to the Carried Forward Balance account and the March entry is a credit to the Carried Forward Balance account. So effectively, we are simply debiting the carried forward balance account in one month and then crediting the same account for the same amount in the very next month, all within the one settlement that has been split by month. This allows you to reconcile to the one journal only, rather than trying to match the deposit to multiple entries.